Scientists say they may have found the world's first blood test that predicts when someone at risk is likely to get Huntington's disease and tracks how quickly damage to the brain occurs. Experts describe the early research as a "major advance" in this field. 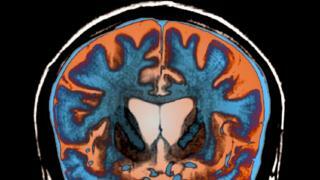 The study, in the Lancet Neurology, suggests the prototype test could help in the hunt for new treatments. Huntington's disease is an inherited and incurable brain disorder that is currently fatal. About 10,000 people in the UK have the condition and about 25,000 are at risk. It is passed on through genes, and children who inherit a faulty gene from parents have a 50% chance of getting the disease in later life. People can develop a range of problems including involuntary movements, personality changes and altered behaviour and may be fully dependent on carers towards the end of their lives. In this study, an international team - including researchers from University College London - looked at 200 people with genes for Huntington's disease - some of whom already had signs of the disease, and others at earlier stages. They compared them to some 100 people who were not at risk of getting the condition. Volunteers had several tests over three years, including brain scans and clinical check-ups to see how Huntington's disease affected people's thinking skills and movement as the condition became more severe. At the same time scientists looked for clues in blood samples - measuring a substance called neurofilament light chain (NFL) - released from damaged brain cells. They found levels of the brain protein were high in people with Huntington's disease and were even elevated in people who carried the gene for Huntington's disease but were many years away from showing any symptoms. And researchers found NFL levels rose as the condition worsened and as people's brains shrank over time. Dr Edward Wild, at UCL, said: "Neurofilament light chain has the potential to serve as a speedometer in Huntington's disease, since a single blood test reflects how quickly the brain is changing. "We have been trying to identify blood biomarkers to help track the progression of Huntington's disease for well over a decade and this is the best candidate we have seen so far." Researchers suggest it could be more rapid and cheaper than current methods of measuring the progress of the disease, such as invasive tests of spinal fluid and brain scans. And they say the blood test could be particularly helpful when checking if new treatments show any signs of being able halt the progress of the condition. Commenting in the Lancet Neurology, Prof Christopher Ross and Prof Jee Bang of John Hopkins University described the study as "remarkable". They added: "The study represents a major advance in the field of Huntington's disease and neurodegeneration in general…"
But they cautioned that it was important to carry out further, larger trials to confirm the results. Scientists working on the original study agreed that further experiments were needed to fully understand the pros and cons of the test, before it could be of any help to patients. They have launched a larger trial. Cath Stanley, chief executive of Hungtington's Disease Association, said: "This is a ground breaking piece of research that takes nearer to having a better understanding about Huntington's disease."